Megatron looks very dangerous. What are you planning for camouflage? I actually released it on June 2nd last year. I just posted those rendering to demonstrate the light effects. The colouring is just a basic 2 tone british cam with camouflage netting covering parts of the hull. 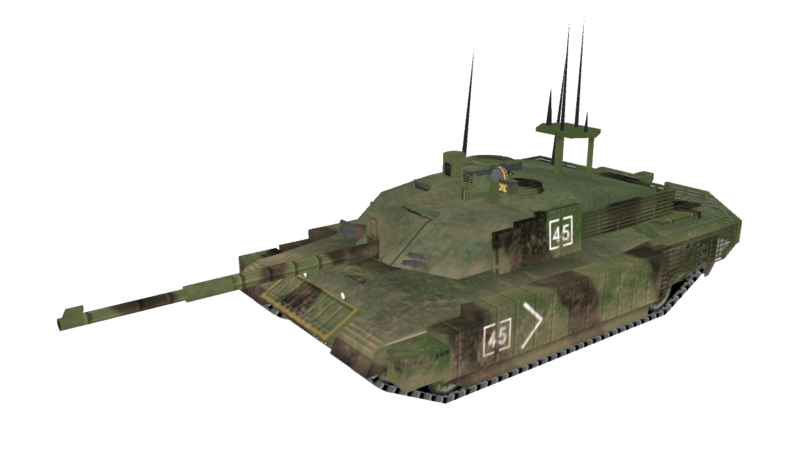 That is the finished version with region group M textures. Other than that it only comes in basic green. 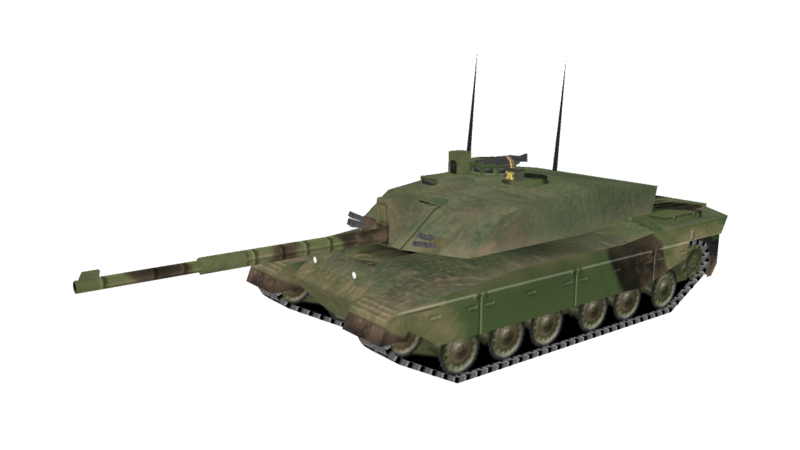 Also just for the record Megatron is the nickname of an up-armoured FV4034 Challenger 2 of the Queen's Royal Hussars. I used several pictures of that vehicle for reference which is why I am referring to it by that name. I do plan to make a stripped down "regular" FV4034. The model is made to easily support that. The camouflage netting will also be removed which will necessitate additional details on the hull. So far though I have not even gotten to the point of creating a separate texture set for it. The extra space on the texture map and lower tris count also allow me to put additional details on it. Without camouflage it looked like a futuristic laser tank. Now I can clearly see that the British tank is in question. My collection of new Type 73's so far. Yes they are all Type 73's. No the Izuzu type 73 truck is not staying red. I will probably get back to the incomplete December aircraft in February. Also I am planning on swapping from Dropbox to Github. That should make it easier for me to post incomplete content for people to play with should they feel like it. The best example would be the December aircraft as all can be converted just fine right now and have proper default as well as (more) regional textures added along the way. I will probably try and get around to uploading some converted models to a github repository over the next few days. I got around 10 PRC and USSR submarines that are basically ready and the December aircraft are also at a point where I would call them serviceable. Chances are there will not be any picnums or UGBITS entries available right away though. Again this will be for those that want to mess around with things. I also got another 30 or so models that I would like to get to that point. I will probably have to get better at keeping my google spreadsheet updated as that will largely be the reference source. I finally finished converting the aircraft from december and some mostly PRC warships as well as a few other models. Please be aware that this very much is incomplete. Note that there are no UGBITS files yet so it is blank icons or using the 3D models. There are no picnums entries either. The scales should be comparable to models I have already made so using existing picnums entries a base should be doable. I will get around to making some at a later point. For now my priority is just models and textures. Also almost all the aircraft are still just grey. This document really will be the main go-to reference source until I get around to making a proper release. Here is an updated rendering for mostly PLAN vessels. The Type 052C (3rd ship from the front) and all submarines but the 5th from the front and last are included. As mentioned these together with the aircraft I posted through December makes up the bulk of models on the repository. 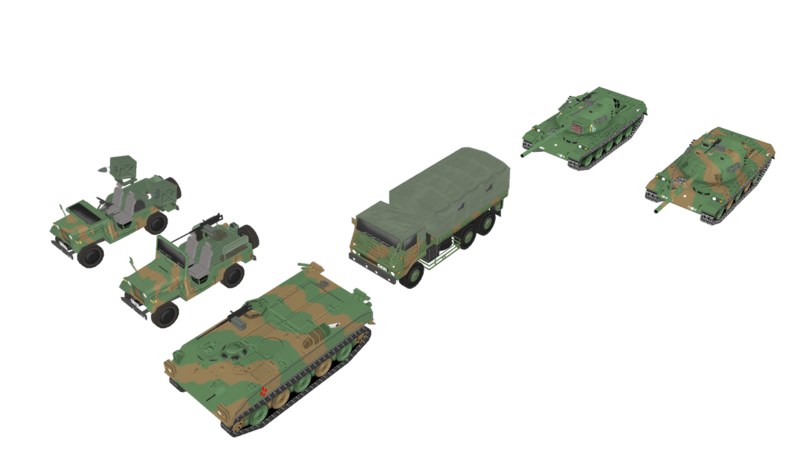 Also here is another render of the 1970's JSDF vehicles. Both of the tanks are Type 74 "Nana-yon" MBT's. I want to make a basic, E and G/Kai variant. This is really something just intended for my own personal usage as I have multiple versions of this tank in my own modded install. None of these are on github as they are lacking default textures of any kind. I should have another update in a day or so which will include some form of picnums entries as well as some proper textures for a few planes. I have uploaded an update to Github. There are now proper UGBITS for some models. Basically the ones that have mostly finished textures. I am currently not planning to render out a bunch of temporary pictures. Further there are now picnums for all models including those with placeholder textures. All entries list what they are so it should also be usable as a reference sheet. Scales might not be perfect as they are just based of existing models I have exported previously from a source file. It can however be adjusted quite easily without the need to recompile. The value just before the description is the scale (usually a complex number around 0.075). The YS-11E, YS-11EB, A330-200 MRTT, F-4D Skyray and Tornado should now have proper textures. 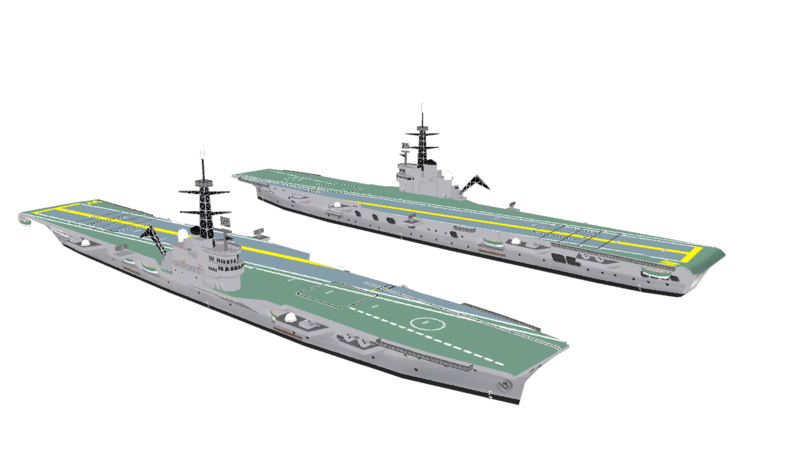 These models baring any tweaks together with the warships should largely be considered finished. 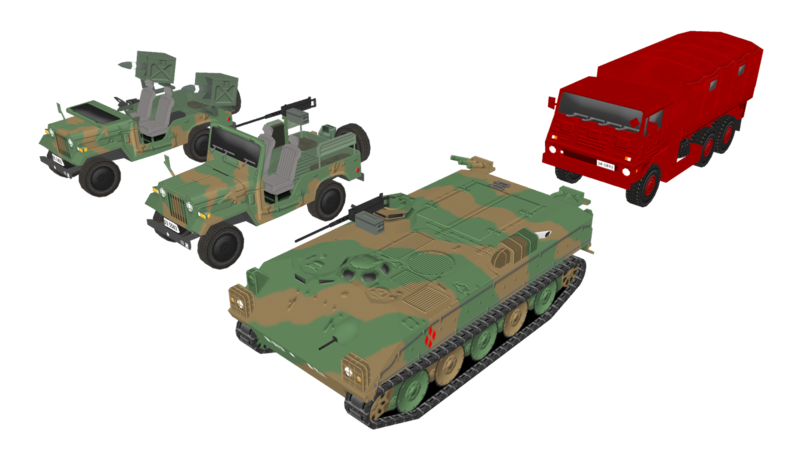 Also the model of the YS-11EB, Tornado and Type 035 Ming have had their meshes updated. These are only minor changes so probably not noticeable but I still want them updated. Finally here is something fairly different that I have been working on and off for some time. It is far from finished. 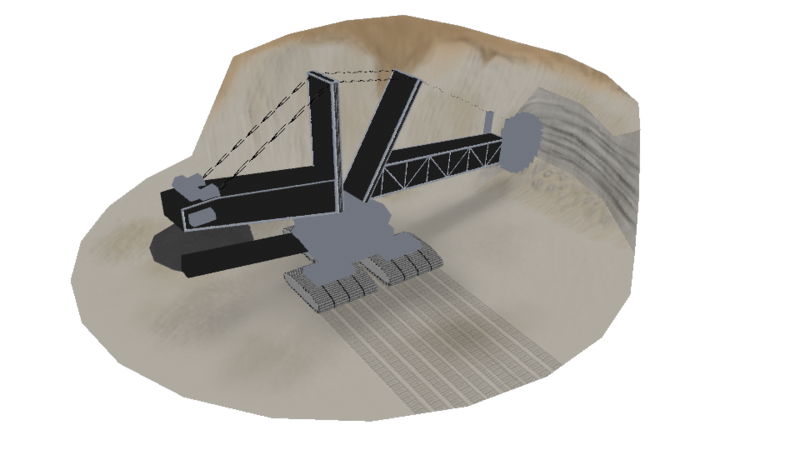 This mainly exist as I want a more modern looking mine. The black sections will not be transparent on the finished model for technical reasons. The game supports a limited number of objects in each model and the game culls occluded surfaces even if the surface blocking them are transparent. Consider a helicopter model. If the main rotor and fuselage is part of the same object the rotors even if transparent will make the game cull every part of the fuselage they cover as seen form the camera. Basically I will have to make a lot of different objects in the model which will increase tris count and even if that is okay I will very likely need way too many individual objects for it to work anyway. The only exception might be the cabling although I might also do that as purely polygonal objects. It would add 12-36 tris depending on how many cables I want but would allow me to use a non-transparent texture which makes it smaller. The texture can probably support somewhere between 5 and 10 different types of resource piles although I am unlikely to do it that way if I make more mine type buildings. When these models from github have textures will we need a recache? You mean those ships are red or all the models in general? 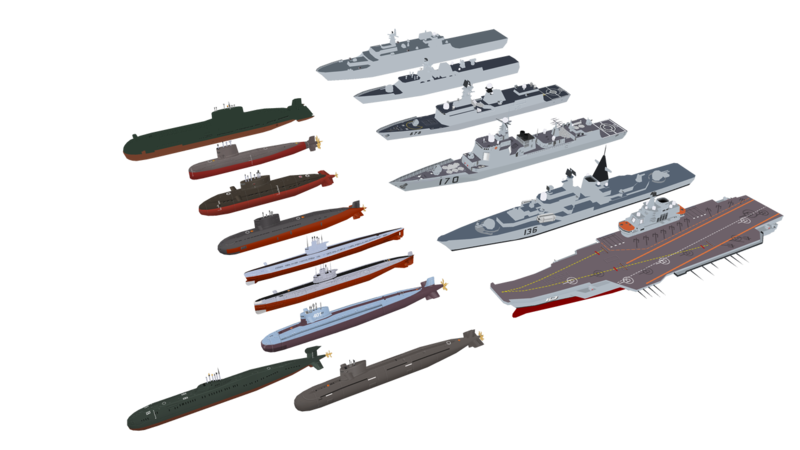 I just did a quick test for the PLAN warships and their textures all load fine for me. Red would indicate that either the UV map is broken or they are somehow reading the wrong texture map. If they could not find a texture they would just be transparent. You will not need to recache for new textures. The only time you will need to recache is when you make a unit design use a new model. You can change models, textures, UGBITS, picnum entries and the like on the fly and all you will is to restart the game. Basically anything in the graphics folder can be changed without the need for a recache. With picnums changes you can get away with just reloading a save as it appears the game reads that file when it loads a savegame. Also I agree a scale around 0.5 is better. I will get it changed. edit: I just copied all of the content in meshes into the game meshes folder. I will try and see if copying the entire structure does something strange. edit2: just tried copying the files into the SR root folder and it still works for me. I am at a loss as to what could be causing the red textures.